I’m not a big kit buyer, but when my friends and I were on our self-directed Iowa Shop Hop back in 2005, I spotted this wall hanging at Quilting Connections in Ames, Iowa. 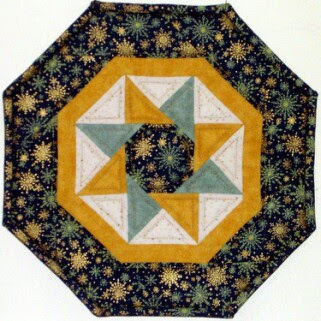 The pattern is Twisting Star Table Toppers from Quilt Tales. I knew I needed to make it for my mother as she was decorating her new home with magnolias. I finally got it made it in December 2006. This is the 24″ table topper. A few years later when my first great-nephew was born, my friends and I traveled to Saint Louis to meet him and of course do a shop hop along the way. On that trip I spotted the magnolia and stripe fabric. I called my husband and directed him to the pattern in my sewing room — quite a feat given the state of the sewing room at that time. He read off the yardage requirements and I bought enough fabric to make 4 more toppers. These went to my sister-in-laws and aunt from Mississippi. Warm and Natural batting was used and my favorite khaki thread. I created pockets on the side for balsa wood stays and sewed plastic rings to the top corners for hanging. 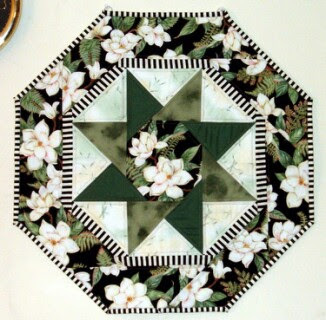 This is a 13″ candle mat made from the same pattern made after I made Mom’s quilt. If was for a Christmas swap in the quilt club I was in back in 2006. Linking up to Throwback Thursday over at Krista Quilts.